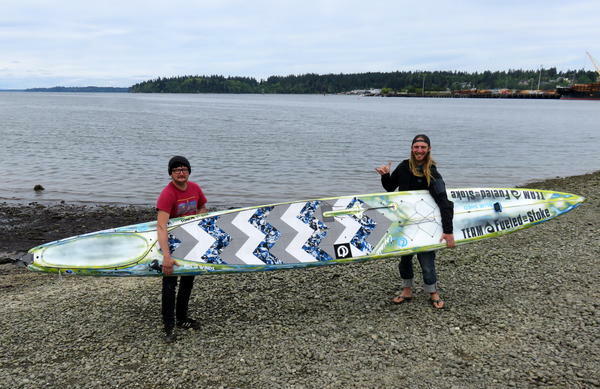 Erdogan Kirac, left, and Luke Burritt of Bellingham are planning to compete in the Race to Alaska on twin boards including this one. The custom-built paddleboards are 17.5 feet long -- or tall! Team Fueled On Stoke posed at Lost Lake near Mount Hood, Oregon. 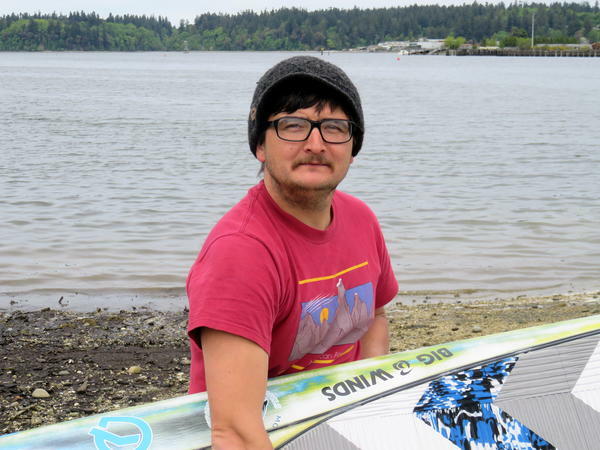 R2AK paddleboard competitor Erdogan Kirac, 32, works as a boatyard technician in Bellingham. R2AK paddleboard competitor Luke Burritt, 33, works seasonally as a sailboat rigger, paddleboard instructor or climbing guide. 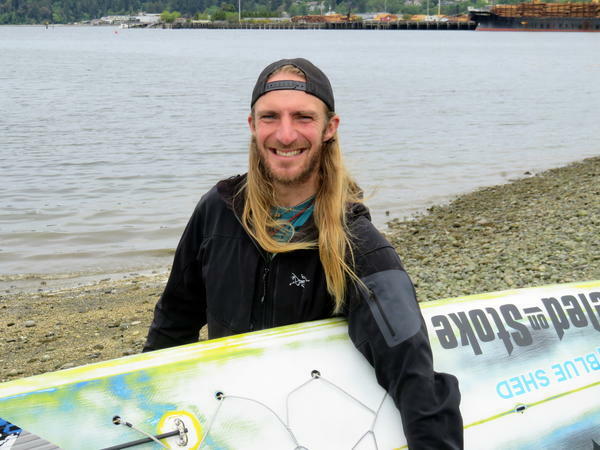 Three experienced paddleboarders are in the field of sail or human-powered vessels signed up to compete in this year's Race to Alaska. The starting gun for the third edition of the zany adventure race fires at dawn's early light on June 8. Sailors, rowers and paddlers will cast off from Port Townsend, Washington on a maritime marathon along the historic gold rush route to Ketchikan, Alaska. "Yeah, I definitely feel it can be done safely," said paddleboarder Erdogan Kirac of Bellingham, Washington, when asked about the big water along the way and the minimal protection from the elements provided by his chosen craft. 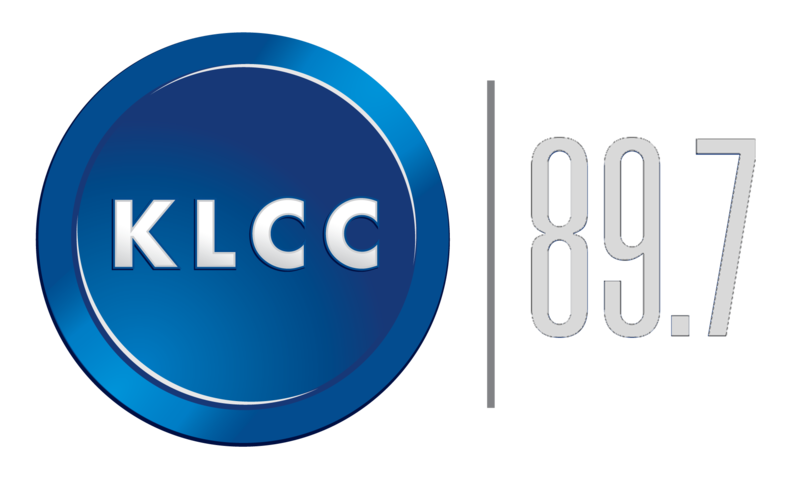 Kirac entered the Race to Alaska on the urging of his friend Luke Burritt. 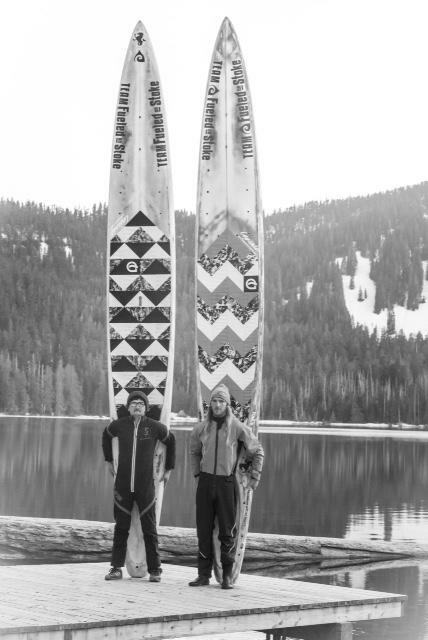 They plan to paddle together the whole way as a team on separate 17.5-foot boards. "We don't want to die," Burritt said in all seriousness. "Of course, what we are doing is a little nutty. But no, we're not looking at dying." Burritt said he was inspired to try something no one has achieved before on a paddleboard. "My life kind of is adventure," Burritt explained. "I have immersed myself in it -- climbing guide and paddleboard instructor who lives in a van. That is what I do. I kind of live for being outdoors and the adventure." The Race to Alaska has two basic rules: no motors and no support crews. A race co-founder once compared the event to the Iditarod sled dog race, "but with a chance of drowning or being eaten by a bear or run over by a freighter." The custom built paddleboards that Burritt and Kirac will stand aboard have 28 tie downs for gear along their long and narrow lengths. The competitors' ultra-light gear include drysuits, water filter, mosquito proof hammocks to sleep in, pepper spray in case of bears and three to four days of food at a time. "We're also planning on doing as much foraging and scavenging as we can," Kirac said for seaweed or shellfish to eat. One of the places they trained was in the heavy swells on the Columbia River in the gorge near Hood River, Oregon. "You’re paddling 50 feet from your buddy and all of sudden, ‘Where’d he go?’ Because one of the swells didn’t swallow him up but it’s too tall. You just can’t see over it," Kirac recalled. "It’s super fun to go do something like that. You have the right equipment on so you do feel safe." Kirac declined to estimate a race finish time other than to say the team aims to average about 35 miles per day. That means they're not in it for the $10,000 top prize or the second place award of a set of steak knives. Instead, they are relying in part on crowdfunding to cover expenses via a GoFundMe webpage. So is the third paddleboarder entered in the race. Karl Kruger of Orcas Island, Washington is making his second, solo attempt at the Race to Alaska. He dropped out after 100 miles last year due to stress fractures in his board. Kruger now has a new custom racing/expedition board. He plans to sustain himself mainly on high calorie food pellets along with some protein shakes and energy bars and gels. "It absolutely crushed me to have to pull out so early last year," Kruger said in an interview Wednesday. "Stamina wise I was feeling happy. (But) it was like paddling a wet mattress." "I knew right then that I'll be back. It was immediately back to the drawing boards." Kruger said he is psyched about his new, tougher paddleboard, which he has been training on since the beginning of this year. "She has a real powerful manner to her with a glide like I've never experienced before," he enthused. The 44-year-old, who runs a charter excursion company with his wife for a living, said he is optimistically aiming to paddle for two eight-hour shifts per day. He said it would be reasonable to expect him to finish the race in around three weeks. Race to Alaska co-founder Jake Beattie says the organizers carefully vetted the stand-up paddleboarders and other even smaller craft in the race. "Generally, we have a high degree of skepticism around paddleboarders," Beattie said. "In fact when we were starting this race three years ago, (race boss Daniel Evans) and I were remembering that we looked at each other and said, 'Well, one thing is for sure. We're never going to let a paddleboard into this race.' This year, of course, we let three in," he said with a chuckle. Paddleboarding is a fast growing sport here in the Pacific Northwest and worldwide -- and long distance races are multiplying too. Eleven paddleboarders entered last summer's Yukon River Quest race from Whitehorse to Dawson. Nine of those finished the 444 mile (715 km) downriver journey. The annual Molokai 2 Oahu paddleboard race crosses 32 miles of rough, open water in Hawaii. Demand for race entries exceeds supply requiring a lottery to get in. Beattie employs a razor sharp wit when composing biographical capsules of the competitors for the Race to Alaska website. The race co-founder said on Kruger's bio page that the paddleboard entries naturally provoke disbelief, followed by many questions. "How did one come to hate their feet enough to keep them wet and cold for 750 miles? Why would you choose something that sounds so miserable? Think of standing for a 750 mile bus trip– sounds horrible and you’re not even making the thing move," Beattie wrote in good humor. "After the questions comes the special kind of awe that is unencumbered by envy, (Really, you are going to eat food pellets every hour for a week?)" This year's Race to Alaska has 41 entries for the full race, about the same as last year. A colorful assortment of additional sail and human-powered craft join the flotilla for the initial qualifying segment from Port Townsend to Victoria, now dubbed the "Proving Ground." A 32-foot racing catamaran set the course record last year by covering the distance from Victoria to southeast Alaska in three days, twenty hours and 13 minutes. Smaller craft entered in the race this year include a 16-foot Hobie Cat beach catamaran, a 14-foot rowboat and a two-person open rowing scull.